Across the two weeks we collected six sediment core sequences from lakes and peat bogs from a mixture of settings. Three of the sites were around 3000-3500m in elevation, which places them in a key agricultural zone in the Andes. The two sites in the Cordillera Blanca were formed of infilled basins surrounded by agricultural fields productive at present day. The crops grown around the sites included maize, quinoa, wheat and barley as well as flowers, in a diversion from traditional crops to ‘cash crops’ for export. It is hoped these cores will provide records of changes in agricultural activity and productivity in the past. One other exciting thing about these two sites is their proximity to Huascarán Glacier, where one of the main ice core records for the tropics originates. This will allow me to compare any environmental signals with the core sequences to an independent climate record, which is very proximal to the sites. The other three cores collected, all from the Chillón Valley, were situated above 4000m in the puna pastoral zone, which will hopefully provide a record of camelid herding and animal husbandry activities in the past in the form of Non-Pollen Palynmorph analysis. These sites were surrounding by carrels, most of which were not in use at present day indicating animal herding took place in the region in the past. I also had the opportunity to attend two workshops in Ancash and Lima. 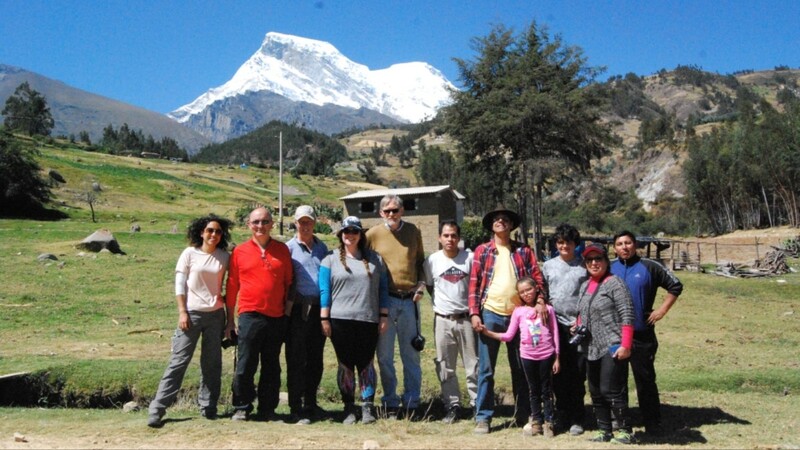 The workshop in Huaraz at the Universidad National Santiago Antunez de Mayolo was entitled ‘Living with Climate Change’, and discussed issues around climate change, glacier retreat, water management, quality, environmental change, and food production. This workshop was attended by members of the Mountain Institute, the National Institute of Investigation on Glaciers and Mountain Ecosystems, local community members, mountain guides and members of the local farming communities. This was a great forum to discuss some of the issues we heard about at the community workshop earlier in the week, concerning living with glacier retreat and limited water availability. The Workshop in Lima at the Universidad Nacional Mayor de San Marcos, focused on food production and climate resilience; past present and future and explored how knowledge of the past can help understand the sustainability and resilience of agricultural systems in the future. This also provide a great opportunity to network with people from the archaeology department as well as the Ministry for Culture in Peru. This entry was posted in Field work, PhD and tagged Josie Handley. Bookmark the permalink.